Way back in 2015 I managed to snag myself a copy of the elusive Check Your 6! Jet Age Rules, which are considered among some of the finest Jet AGE combat games out there. I have always loved Jets, and other Cold War Ear Technology, and Check Your 6! Jet Age covers that period splendidly. 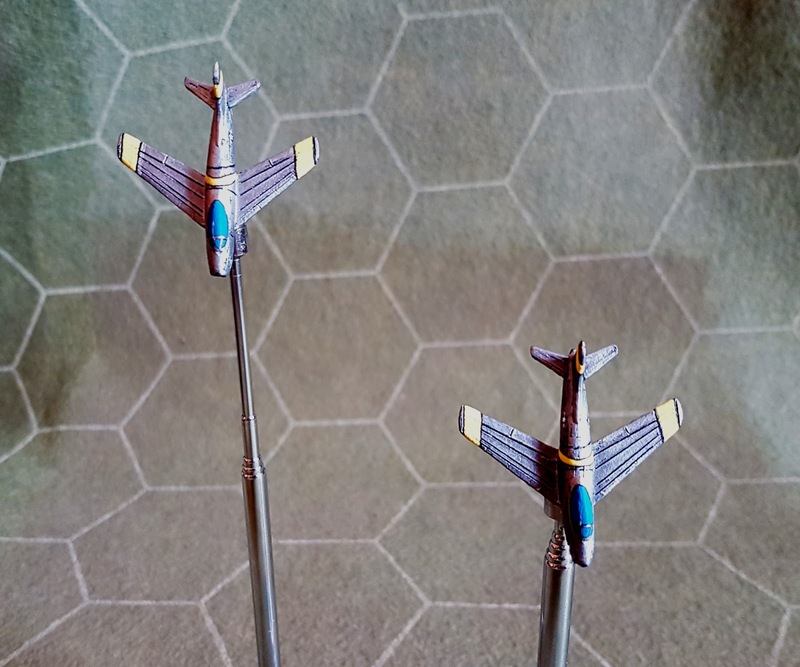 using a modified version of the same system WE use for our WW1 Dogfights: Canvas Eagles. So I figured it would be easy to pick up. And then of course like so many of my games... I never played it. Well, with some interest coming back into Canvas Eagles, I figured I would dust these two planes from Raiden Miniatures off and give them a paint. 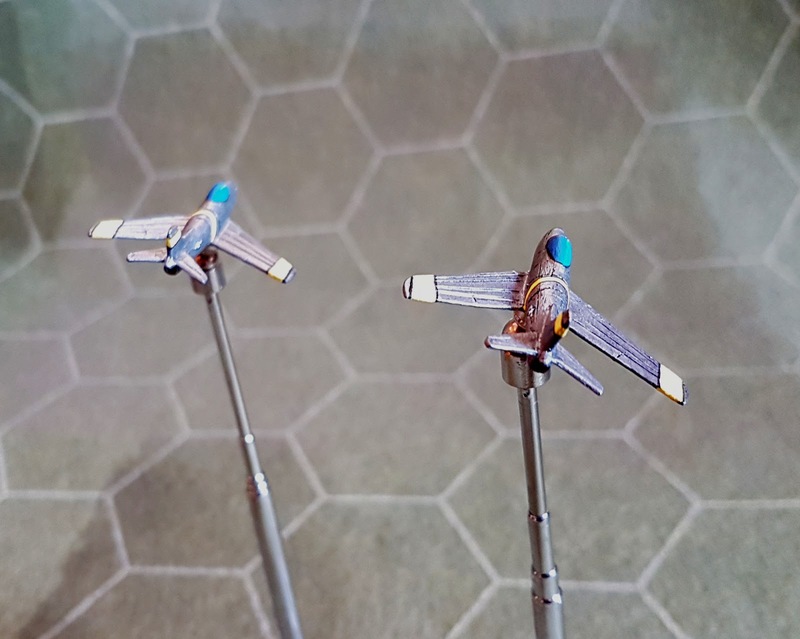 I started with two F86's to match my 2 MiG-15 (which I am in process of painting), figuring it would be a good and simple place to begin exploring Jet Age Combat. We could get to missiles later. These are my first minis from Raiden Miniatures, and I think they are of good quality given the 1/285 scale. Now keep in mind these are not GHQ minis. The quality is not as high and you will need to clean them quite a bit with your knife before they are really paintable. Other details, such as the metal components on the cockpit I had to paint by hand. But given there low price they are a fantastic alternative to GHQ and have a huge selection of Aircraft. I hope to have these jets up in the air soon in a Check Your 6! 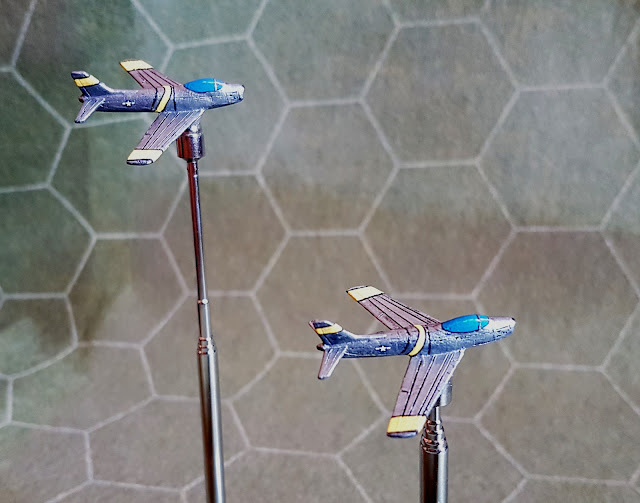 Jet Age battle against their Korean War MiG-15 Counterparts.